In many ways, the hooded merganser is one of the most elegant of waterfowl. The striking black, white and vermiculated rust give it an almost exotic look. The silky crest and golden eyes increase the effect, and yet it is a bird of very unexotic habitat - rather ordinary swamps. The female, of course, is subtle in colour, so that she will not be noticed going to and from the nest and when she is swimming with her flotilla of downy young. 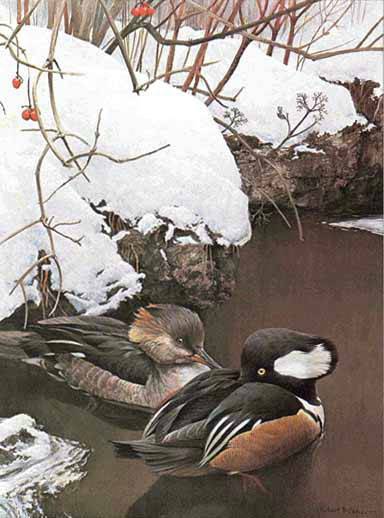 Mergansers belong to a special sub-group of ducks in that they have narrow bills with saw-tooth edges for grasping fish. I have shown this pair in a snowy setting. Although they mostly migrate to the south in winter, it is not unusual to see them in suitable open water with snowy banks. The main thing, of course, is that the water should be open for them to feed. The view is partially from above so that the pattern of snow-covered rocks and birds can relate to the negative shapes of the water. This is a device very often used by Japanese print-makers, particularly in interior scenes. This composition suited me because I wanted a quiet, intimate feeling. The red berries were added to draw the attention away from the strong bull-eye's effect of the bird. ?